My brother and I were running late for our reservation at Marta, a newly opened Danny Meyer pizza joint in the Martha Washington hotel. Both yellow cabs and Uber near Rockefeller Center were unavailable and the streets were clogged with tourists pressing their noses up against the shiny holiday displays on 5th Avenue. A pedicab pulled up right in front of us at the curb. "Where you need to go? I take you there quick. No way you're getting a taxi tonight, mang." We zig-zagged past throngs of people oblivious to traffic lights and almost hit a few cabs that careened in our lane. Swallowing hard, I closed my eyes to the chaotic stress while my brother relished every single stressful minute. 20 blocks and $30 later, my first pedicab ride was over before it began and I saw my two dining companions loitering outside the entrance looking....lost. Ultra-high ceilings and pumpkins greeted us as we settled into our booth. Behind us was the massive bar area and tables full of people. We started with a plate of Frittura Di Zucca, perfectly fried Delicata Squash. While it wasn't seasoned at all, there was a small bowl of sea salt for you to season to your liking. Don't forget the squirt of lemon. The menu is divided into two types of pizza: ones with tomato-based sauce (pizze rosse) and ones without (pizze bianche). 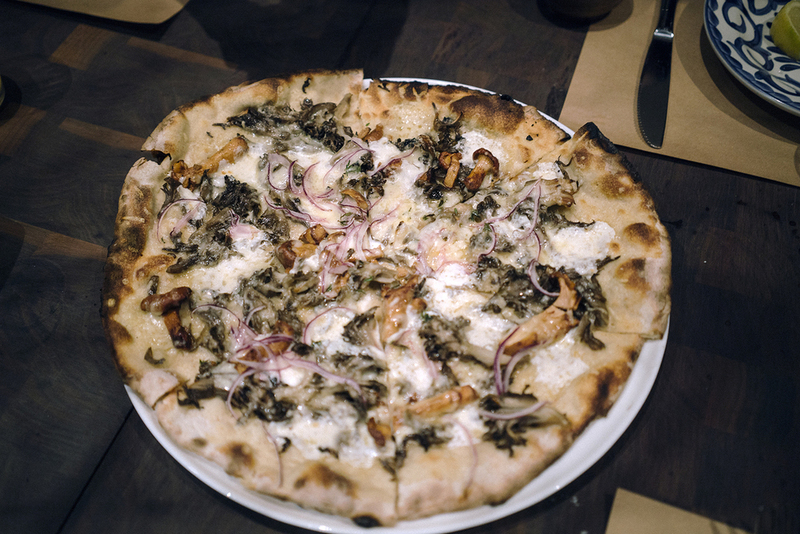 The first Bianche pizza that we tried turned out to be one of our favorites of the night. 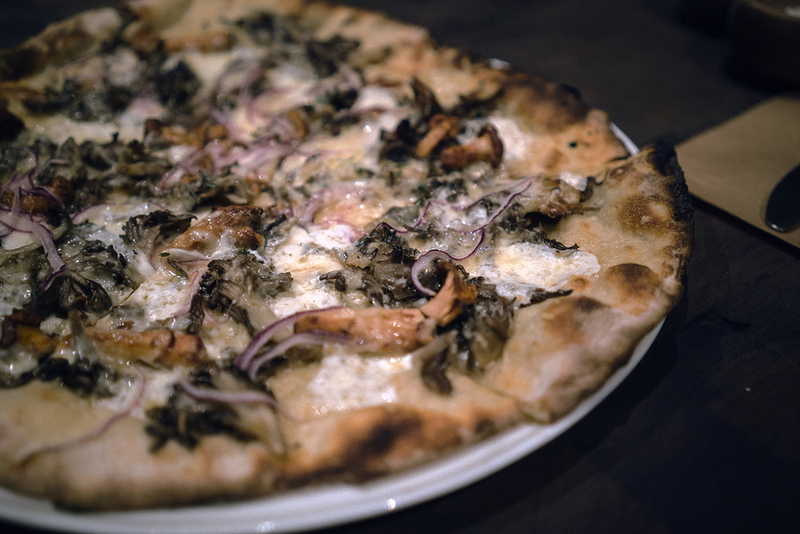 This Funghi was covered with Fontina, Hen of the Woods, Chanterelles, Red Onion, Thyme. As a mushroom enthusiast, I've seen how much chanterelles and hen of the woods go for at the grocery store so I savored every bite, paired with flavorful thyme and creamy fontina. The Salsiccia with crimini mushrooms had plenty of pork sausage with a kick. 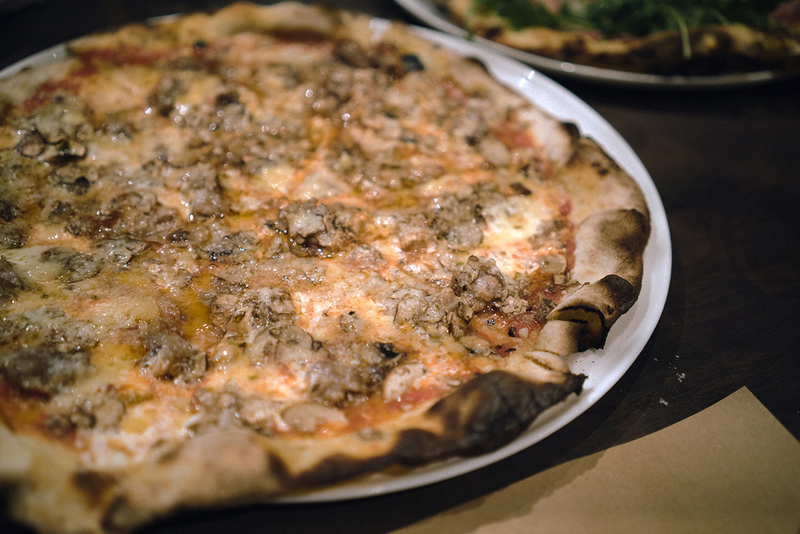 Notice the blistered crust that delivers a subtle smoky flavor. As we were examining the thin crust, a manager came by and told us how much work it took to make the Roman-style thin crust pizzas in front of us. $35k for one wood-fired oven. They have two. $130k for proper ventilation of the oven's chimneys that go up to the roof. $3k/week on wood alone. They used to source the wood from a guy in West Chester but because the wood was a little wet it created more smoke and didn't burn as hot. After 4 to 6 weeks of trial, they realized that drier wood is better. They also experimented with the moisture of the dough recipe that allows the dough to stay inside the oven for a longer period of time without drying out and burning for a few minutes at 700-750F instead of the usual 900F for a traditional Neopolitan. 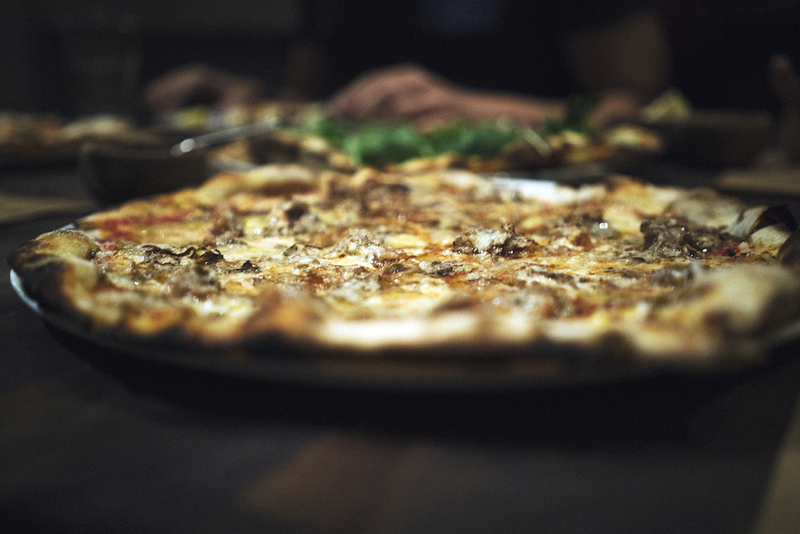 The margin for error is very thin, about 15 seconds, that determines if the pizza comes perfectly fired or burnt. The Coppa Cotta was Doug's favorite. Savory shoulder ham with peppery arugula in every bite. The Margherita Classica consisted of mozzarella and basil, as basic and pure as you can get. This benchmark pie was slathered with a nice layer of tomato sauce that was light and fresh. Chef Nick Anderer (far right) instructing his team. As thin as it gets. 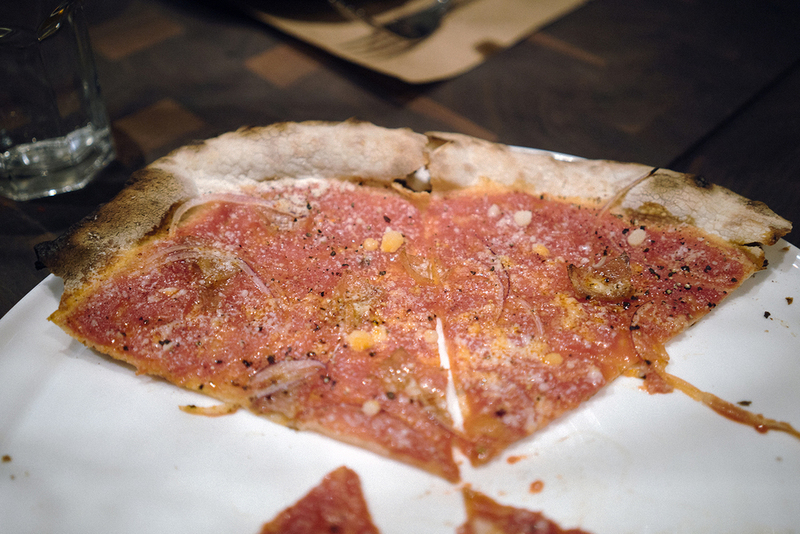 After catching up, we decided to get our fifth pizza, the Amatriciana with pecorino and crispy guanciale, aka bacon. Our group of four easily polished off the six slices and began to mentally prepare for credit card roulette to pay the bill. Like the degenerates we were, we downloaded a dice app onto our phone. Highest number rolled wins and is exempt from the bill. After a few tense rounds, I lost but gladly paid the bill because the pizza was pretty great. The night ended with a quick capture of the kitchen in action, each member focused on the task at hand, rolling the dough, spreading the tomato sauce with a spoon, scattering toppings, and taking out the pizzas with a paddle. Menu: Since we were there to focus on the pizzas, we didn't get any of the other entrees. Along with the entrees, I'd also like to try the Patate Alla Carbonara (Potatoes, Guanciale, Black Pepper, Pecorino, Egg) and the Cavolini (Brussels Sprouts, Cauliflower, Pickled Chili, Parmigiano) on my next visit. What I liked: I enjoyed all the pizzas we selected not only because of the flavors but the actual pizza itself - really thin crusts that tasted like Communion wafers. Also because they were small and thin, we were able to try 5 pizzas without getting full. Lastly, they were priced between $13-$18/pie. Our bill for 4 people ended up being only $107 for 5 pies, 1 beer, and 1 appetizer. 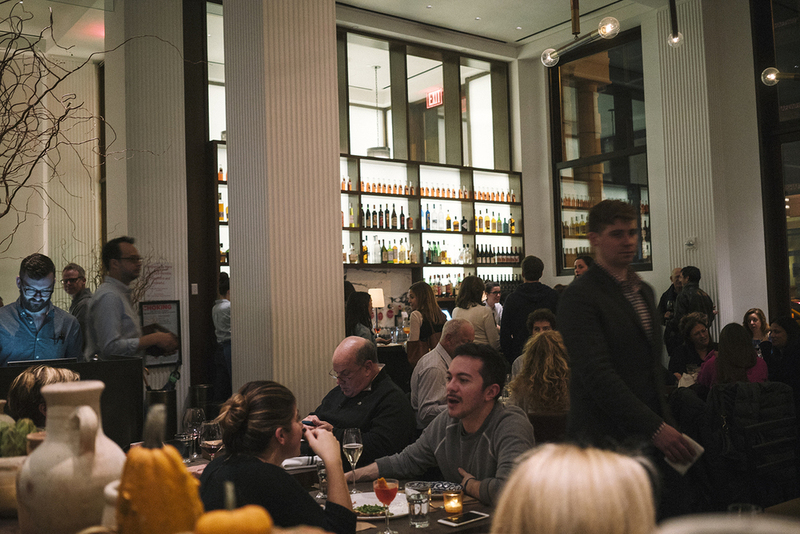 Room for improvement: The service wasn't at the level of Danny Meyer's other establishments. It took a while to get our server's attention to order more food and our glasses weren't always filled. Granted it's a pizza joint instead of Gramercy Tavern and The Modern, but attentive service is a general tenet that should still apply.